Saturday morning I got up, organized my grocery list and went to the store. I needed a bunch of stuff plus Zyrtec so that was an expensive visit. Canned fruit/veggies were on sale so stocked up on those, now the cupboard is so full you can hardly get in there, much less find anything. And butter was $1.99 a pound, I showed great restraint and only got 7 pounds. Got home just in time to turn around and run to JoAnn’s and get a stick iron before my radio show started. Decided I needed the stick iron if I was going to stay sane putting my landscape fusible quilt together. It helped, but it is still a pain. If I am going to make something this large with fusible pieces again I need to figure out an easier way. It is all up and assembled on the wall, but all the pieces have fusible webbing on the back of them, and they aren’t attached to anything, just stuck up there. So I have been carefully removing pins and putting my Teflon pressing sheet behind the pieces and ironing them together. Next time I will put my batting on the wall so I can just iron the pieces right on there. I worked on that while listening to “Wait Wait Don’t Tell Me” on PBS, and then it was time to make lunch. Made rolled club sandwich with some modifications. http://www.pillsbury.com/recipes/baked-club-sandwich-rounds/7e7df15c-df0b-4d36-a95d-b7bc20c7da35/. (I have posted pictures of this before, got the recipe from Sister-in-Law Kristyn and it is one of Ken’s favorites). Pulled out the turkey I had purchased a while ago, the first time I tasted it (last week?) it didn’t taste quite right, so I tossed that. Then I looked at the two packages of turkey Ken bought about 2 weeks ago – and noticed that one of them said “Use by February 2012” – I am still training him to look at expiration dates, but come on, February?? What store doesn’t check their luncheon meat? And his other package said “April 5” but I opened it up and gave it the sniff test and it didn’t pass. Well, I had some soprasetta and uncured salami from when I was on my “meat and cheese tray” kick in March, and they were just fine. I also spread the unrolled bread with pesto to give it a little more taste. Ken isn’t wild about the pesto but I limit the amount and it is overshadowed by all the BACON and CHEESE. Then I stirred up the Bavarian Cream Jello, as well as a pan of brownies (Hershey’s recipe from Aunt Eileen) Again, w /some modifications, I ran out of cocoa and so I shoveled in some Nestle Quik type cocoa. Ken pronounced that they tasted “Different than your Aunt’s” so I don’t know if he will eat many but I will send them to work with him or I will eat them all week (I will keep a couple for treat). By that time I was tired and wishing for a nap, and Ken had gone to the range to hit range balls, but I was checking the TV schedule on the computer and Antiques Roadshow was on, so I substituted that for a nap, and did some embroidering as well. 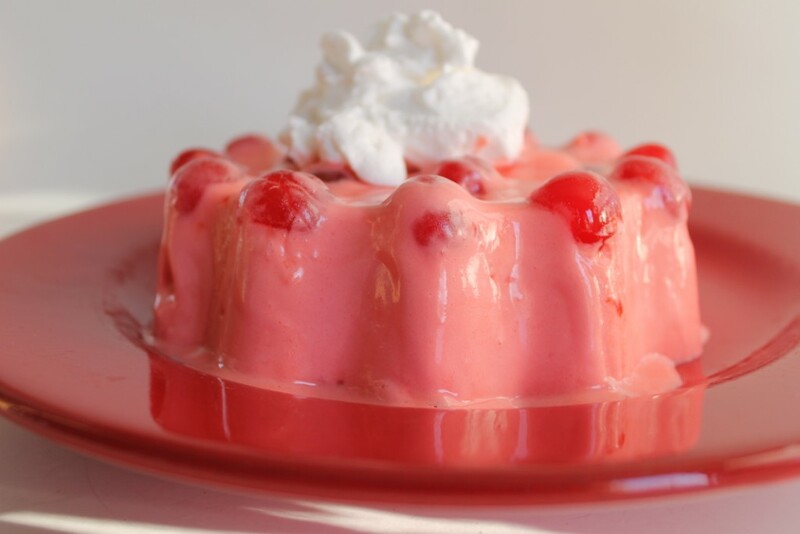 Ken’s quote about my anticipated Jello-fest – “I said I’d eat plain jello, not weird stuff with s*** in it.” I told him he has to try one bite…..He asked me “Would your dad like this?” “YES!” I said, it has cherries and Jello and Cool Whip. I married someone who doesn’t like Cool Whip, I am not sure how this happened. Ken had to stop at the grocery story on the way home because I wanted to make stroganoff for dinner but I forgot to put sour cream on the list. Of course, he needed breakfast stuff and hadn’t put that on the list, so he got that too. Put together the stroganoff (I pretty much use Paula Deen’s recipe, but put in some Worcestershire sauce for extra flavoring, and we eat it with egg noodles.) I used to just use cream of mushroom soup and sour cream, but the addition of beef broth (I just use water and “Better than Broth”) makes the gravy stretch a little longer. We both watched some of the Masters. Here is the Jello mold “Bavarian Cream” and the recipe. I didn’t quite achieve the perfection of the picture in the Jello book but I was pretty happy with it. And it was tasty. And Ken ate it, except for the cherries and the whipped topping (once again, must be some sort of genetic defect….) Recipe and pic from the “Joys of Jello” book below. It also got a little melty when I dipped it in the hot water to get it out of the mold. I tried warm water and that wasn’t doing it, so I went with hot, and it was too much, but hey, it did come out of the mold. Did you know they still make Dream Whip? The box version of Cool Whip? King Soopers even has a Kroger brand version, which is good because otherwise it is kind of expensive. 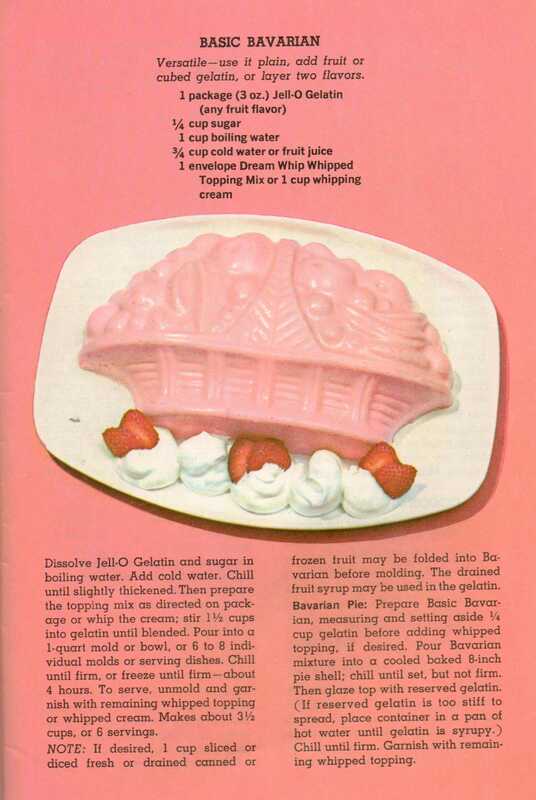 This entry was posted in Cooking, Mid-Century Recipes, Recipes and tagged Food, jello, recipes, vintage cookbook, vintage recipe by glenderella. Bookmark the permalink. I found out about the Dream Whip when I filled the church “food basket” box – it was on the list of requested items. I remember using a lot of it in the 80’s dieting days. It doesn’t seem to be called for much anymore.